My experience with Michelin tires has primary been with their OEM car tires and those have not exactly wowed me. However, I also know that Michelin makes tires for some of the fastest supercars in the world so I figured that a sport-touring tire for a motorcycle ought to be manageable for their engineering teams. After a week in the shop for a few different things, including the new tires, I had the BMW back in my possession. The first thing I noticed with the new tires is just how many grooves there are. This would seem to indicate that wet condition traction and water evacuation are big priorities. Still, the tire design had plenty of rubber in contact with the road at any one time and should offer plenty of grip in the dry. Before the bike was put away for the winter, I managed to squeeze in one good ride on the new tires, taking it pretty easy in case there was still the mold release compound on the tire surface that needed to be scrubbed away. Initial impressions were that the grip was actually surprisingly good despite all of the channels cut into it. The shape of the tire makes the bike tip from side to side very easily, making the steering feel more responsive than before. Once leaned over, the different compounds along the edge of the tire provides very stable and clean cornering. 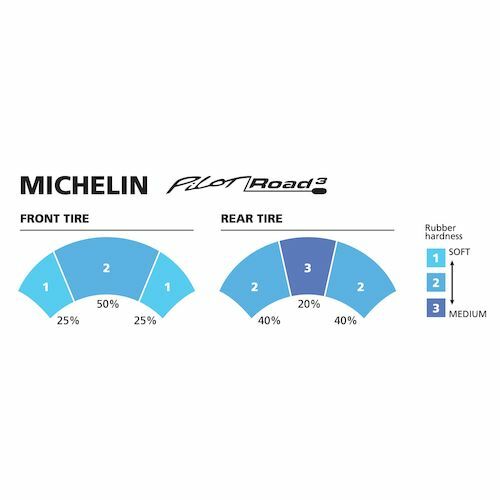 Speaking of the tire's composition, it is designed with three distinct bands of rubber material. Down the center of the tire is a harder, more resilient compound designed for long distance riding and big mileage. As you move out towards the edge and the tire curves, the compound changes to a softer compound designed with cornering in mind. This design allows for much better wear characteristics for greater tire life without sacrificing grip in the corners. After over a thousand miles on the tires, I could not be happier with the choice. Having been caught in some pretty severe rain several times this spring, I can honestly say that the Pilot Road 3 tires are incredibly confidence inspiring in the wet, allowing me to continue to ride at a moderate pace without fear of loss of traction. In the dry, they have been extremely progressive in their grip and break-away, allowing me to easily sense when the limit of traction is approaching and adjust accordingly. The tire is just starting to show a little bit of wear in the middle, but seems to be retaining its shape well overall. As a complement to any serious sport-touring bike, the Michelin Pilot Road 3 makes an excellent choice for riders who put lots of miles on their bikes and want the peace of mind that they will not be compromising on wear or handling.